From a holistic point of view the artist-run initiatives of today differ little from the artist-run spaces of the 1980s: they support communities – both creators and audience, they cling to survival through a range of opportunistic enterprises as well as cunning and ingenuity. They usually have at their hub a small lead group who possess a mixed bag of skills – arts-managers, funds brokers, communications moguls and event entrepreneurs with altruistic values that seem to favour the community over personal advantage. These creative communities usually are created as a subculture outside the mainstream structure of the commercial and the public gallery and their gentrified, monetised, artist’s stabled, champagne sipping openings in their pristine white cubes. Artists-run spaces were for a subaltern culture in which art-making, experimentation and presentation worked alongside the lives of participants not so much as something to do, but rather something about life as an art experience itself. 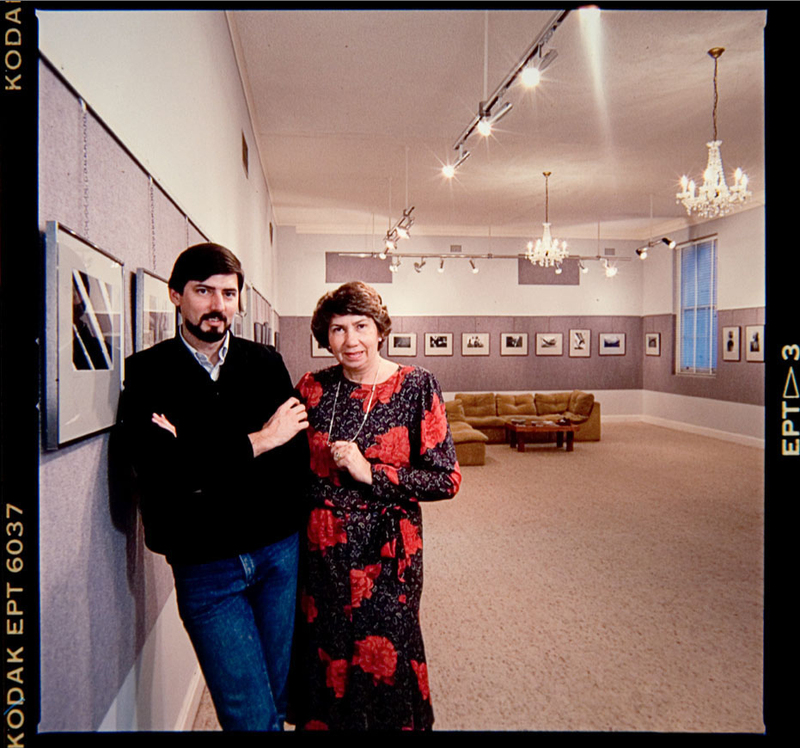 While some of the original intentions and motivations behind the establishment of Imagery Gallery came from the commercial world, my mother, Ruby and I operated a venture that was essentially an artist-run space. We wanted to have a space that showed and represented a broad community of practice. In some ways the idea of a Queensland ‘centre’ for photography like the Australian Centre for Photography was in our minds. As such Imagery Gallery we tried to make it an inclusive space – we showed work that was sourced from a range of contributors from individuals to groups and corporations that had something that they wanted to present to a photographically interested audience. The name ‘Imagery’ came from a body of work that I had created in the rainforest of Lamington National Park in the late 1970s. Additional to the Imagery Gallery business we had another entity called Photo-Décor that was based upon an international campaign led by the Kodak company that encouraged the integration of photographs into corporate and domestic interiors. These were not ‘art photography’ images but rather colour pictorial illustrative works. The first Imagery Gallery venue was on the first floor of the old bank building on the corner of Grey and Melbourne Streets South Brisbane. When we were looking around for a place to rent we had noticed that the Queensland Craft Council occupied the ground floor of that building – we thought that’s handy, two art spaces together. Unfortunately that arrangement never came to pass – the day we moved into the building they moved out. Imagery Gallery opened on March 28, 1980. By the end of 1980 I had left Kodak and my mother left her retail sales position so we could devote ourselves full-time to building Imagery Gallery and the ancillary Photo-Décor business. From the early years we recognised that to survive the gallery needed to be a multi-faceted business concentrating on the practice, art and profession of photography. This soon became the working model for the full time of Imagery’s operation. Rather than contest for the small amount of government funding to establish and support the gallery we also organised and conducted evening workshops in photography with around 30-40 private students a week. We created other opportunities for funding when I took on commercial and portrait assignments, we sold photo equipment like Leica and Sinar cameras, Kodak products, books and magazines. From 1982 we also ran specialist photographer’s tours throughout Australia (mainly outback Northern Territory and Western Australia) and internationally in New Zealand, China, Africa and the West Coast of USA. We did everything we could with the hope of keeping the gallery running as an artists run space. In the 1980s the South Brisbane/Grey/Melbourne Streets precinct was a place of demolition, dust and construction initially due to the construction of the Queensland Cultural Centre and later with the development and redevelopment of the EXPO88 site. Parking was always a problem and in South Brisbane’s unmetered parking zone you had to move your car every so many hours – I often returned to the car with a parking ticket attached to the wind-screen wiper. At a time when the fine was only $20 I tolerated the fines and paid them. I left the wire ticket clasps on the wipers of years – I wore them as a badge of pride. One thing I enjoyed about being in the South Brisbane area was it’s close access to the city and the West End areas. EXPO was an amazingly busy period for us as galley visitors came by the gallery on the way too and from their EXPO visits. I created a significant body of conceptual work using a variety of pseudonyms about the EXPO experience. The people who made Imagery collective were based around the people and associations that Ruby and I had made over the years. Imagery Gallery’s “membership” consisted of professional photographers, mainly from my employment at Kodak and my personal membership of the Institute of Australian Photography as it was called back then, and the more adventurous photographers from the camera club movement and teachers and students from the Queensland College of Art. But mostly it was made up of people who could be called ‘art photographers’ or ‘documentary photographers’ who essentially were employed in other ways but were committed to their personal art making with photography. In time as Imagery’s workshop program got underway a large number of past students, many of whom went on to the Queensland College of Art for further studies, became part of the Imagery collective. We established a ‘Friends of Imagery’ group that supported our activities and also became involved in other ‘Friends only’ events at the gallery including parties, weekends away doing photo-shoots and other photo-related events. The 1980s saw a shift from the documentary form of the art to a more academic / aesthetic / feminist / socio-political / performative scene. Imagery was not really part of that – the perception that a mother and son business seemingly locked into the documentary/pictorial genres of the past did not fit. We encountered evidence of this early in the 1980s when the Director of the Australian Centre for Photography visited Brisbane and made some presentations at the Institute of Modern Art. We made arrangements to meet with the curator and let them know about Imagery and our interest in connecting with ACP. Their response was disappointing to us as they said that they could not see how they could connect with us. We responded by just continuing to develop our networks and getting on with the process of showing work from whoever offered their work to us. It should be noted that only one exhibition was every refused by us and that was in the very early days of the gallery – the exhibition proposal dealt with a documentary record of horses being slaughtered in a knackery. It was just a little too confronting for us at the time. We did not fit either with the commercial gallery scene as we had moved from a commission on sales model very quickly when very little work sold or when sales did happen they seemed to occur ‘outside’ the gallery. Imagery Gallery was listed in a range of journals and publications that listed galleries including the ‘What’s On’ Gallery Guide. At one time the commercial gallery scene in Brisbane was having trouble with the Queensland Newspapers and poor representation in the Courier Mail and Sunday Mail of arts related events and reviews. We attended meetings held by the commercial galleries to add our voice to the resolutions and representations made to the newspaper. In many ways our exhibitions in the 1980s were very well reviewed by a range of commentators, critics and reviewers including Des Partridge, Ray Cash and Bruce Muirhead. At time we did connect occasionally with other artist-run spaces or commercial galleries usually because friends we had who were participants in the other scenes. John Elliott was involved as an exhibitor and curator of many exhibitions at Imagery coordinated a three-venue exhibition called Under the Southern Sun in 1992. The theme dealt with the landscape and featured photographers from around Australia. John had coordinated that it would be shown con-currently at the three galleries: Imagery Gallery, The Photographers Gallery in George Street and The Loading Bay at MOCA in Petrie Bight. I designed the poster and T-shirts and through our tour connections we co-ordinated with a local coach company to bus visitors wanting to see all three exhibitions on the opening day. As mentioned earlier the gallery’s operation on a commission on sales basis did not work. Also the focus on collecting became more about emergent trends in art photography – the second coming of documentary photography did not materialise until the late 1990s. The Queensland Art Gallery did buy from a few early shows but their interest became intermittent and lapsed altogether. When I think back now a whole significant aspect of Queensland photographer’s works – usually inspired by and about Queensland life is not held in our institutions. What a difference there would have been in the visual history of Queensland and the financial success of artist run spaces had institutional collecting had been active. Working in the hire-of-space mode enabled us to show a diversity of photographic practice, which at the time, were generally unsalable. It also enabled a reliable income stream. Potential exhibitors would approach us and we would request that they make a submission for us to review at a meeting in the gallery. At times we would also curate shows from individuals or groups who were making interesting work. After the first 5-6 years our exhibition schedule would be booked months in advance so that the gallery would rarely be empty. In its 15 years, Imagery Gallery showed and curated a diversity of photography and created opportunities for emerging and well-established practitioners to explore ideas and projects. As Ruby and I were also artists needing to show our work, the model of the artist-run space fitted better for us than as commercial gallery operators. Over the 15-year period Imagery Gallery operated in 3 venues. The first gallery location was on the corner of Grey and Melbourne Streets until rental increases and income issues required the relocation to less costly premises in mid 1983 at 149 Melbourne Street (Knowles Bristow Building). The final and most successful iteration was the first floor of the Commonwealth Bank 89 Grey Street South Brisbane from mid 1985 to the gallery’s closure in 1995. Imagery Gallery hours were usually 10-5pm on weekdays with opening on weekends between 1-5pm. At the time I felt that we needed to be open to provide the greatest opportunity for work to be seen. For many years John Hawker from the Photographer’s Gallery and I would lament that the Queensland Art Gallery did not have a dedicated photography exhibition space and did not seem to be actively purchasing works. One day I visited John, who operated a print shop in the foyer of the Photographer’s Gallery, and gave him $50 and the design of a petition form that I’d prepared requesting that the QAG show and purchase more photography… The money was for him to print multiple copies of the petition. We circulated the petition and presented the 2,500 or so signatures to the then Director Doug Hall. That was not the only time that I became involved in advocacy projects for photography. Over three years –1985+86+87 I made arrangements with the organisers of the McGregor Prize for Photography to curate an exhibition of selected works from their awards at Imagery Gallery. I would drive a van up to Toowoomba, collect the works, hang them at Imagery for a week to 10 days – de-hang and return them to Toowoomba. When the Queensland Art Gallery required a darkroom for Australian photographer Max Pam to process and proof his work for the Journeys North commission we were contacted and Max was given a key to the door and access to the our teaching darkroom. On another occasion artist Julie Rapp needed a darkroom to coat the liquid emulsion on glass and to print her images for a Gallery 14 show, the dedicated experimental/installation/almost artist-run space at the Queensland Art Gallery in 1991, Resistance, an installation by Julie Brown-Rapp, 1991, organised by curator Anne Kirker. Julie was also assisted with technical support and supply of materials – Victoria Cooper’s own Liquid Light. Imagery once again provided free of charge access. 1994 DAWN TO DUSK Co-Curator of an exhibition at the Toowoomba Regional Art Gallery utilising emergent digital imaging technologies by 38 photographers documenting Toowoomba. 1992 The Image Captured. An exhibition of the works of 43 contemporary Australian photographers. Co-Curated for the Brisbane Warana Arts Festival and the sponsor ~ Kodak (Australasia) Pty Ltd.
1991 State of the Art ~ Queensland Photography. An exhibition of the works of 32 contemporary Queensland photographers. Curated for the Brisbane Warana Arts Festival and the sponsor Kodak (Australasia) Pty Ltd.
1991 Celebrating 150 Years of Australian Photography. An exhibition featuring the images of the 150th Anniversary Celebration event of the first photograph made in Australia at Macquarie Place in Sydney on May 13, 1842. SESQUI-CENTENNIAL of the first Australian Photograph – I assisted Sandy Barrie with the commemoration of the first photograph taken in Australia in Macquarie Place, Sydney on May 13, 1841. Followed by an exhibition of Daguerreotypes, Australia Post First Day Covers and ephemera from the event at Imagery Gallery, Brisbane. Australia Post came on board with Sandy’s event and the next issue of PHOTO.Graphy journal was posted from Macquarie Place with the official Australia Post First Day Cover cancelling stamp. 1988 The Kodak Araluen Tourist Images Photography Award. Co-curation of an exhibition of Australian photography for this acquisitive award at the Araluen Art Gallery, Alice Springs. Certainly we were connected with the medium of photography and we became the ‘go to’ people if you wanted to know about something photographic or connect with a photographer. In 1991 we were contacted by the Queensland Government’s Premiers Department responding to an invitation to participate in the Sichuan and World Friendly Cities Photography Exhibition. We curated a set of 54 photographs from representing Australian life from our networks. Similarly in 1990 we were approached by an art entrepreneur to curate the Australian photography component of and exhibition on Contemporary Australian Art for ART DOCK ~ Australian Art Exhibition held in Noumea. The question of how we were sometimes seen by others…. The unusual nature of the Imagery Gallery networks often meant that we were seen by the art world, as being firmly linked to the professional photography scene and the camera club movement. Simultaneously the pro-photography and the camera club world viewed us as ‘arty’. There are times today when I look back and think that we were indulgent in the way in which we operated the business – all income was funnelled back into the business and our own need for technology/materials and framing for our own work. Indulgent as most of the income was absorbed in the operating costs of the business – I was paid $100 a week, my income was augmented by sessional teaching and lecturing work at the QCA, and my mother was supported by her husband, my father. There was another reward and that was the real sense of achievement and excitement around what we were doing. We had however an amazing facility with every photo-bling that you could imagine. Additionally we were inspired by the close connection to exhibitions and exhibitors, and importantly, it was a space where we could experiment and pursue our personal art practice. Ultimately in 1995, after 15 years of the gallery’s operation, I was offered a full-time teaching position the TAFE college in Toowoomba – I was getting into my early 40s and needed some financial security in my life. Additionally I had things that I wanted to prove in the field of tertiary photography education and the Toowoomba position offered that opportunity. Over a six-month period at the beginning of 1995 Imagery was gradually dissolved although workshop and tour programs continued for a couple of years. On Imagery Gallery’s closure its archive, around 2 cubic metres in volume, was donated to the State Library of Queensland to contribute to a permanent record of the history of photographic practice undertaken in Queensland during this period. Additional business ephemera, daybooks, accounting records, and photographs were included in this donation. This material is awaiting cataloguing however at this time work is about to begin. Also in the State Library of Queensland is the complete 10 years of the journal PHOTO.Graphy that contains a significant record of the photographic scene in Queensland including reviews, issues, commentaries and exhibition announcements. So what now of the contemporary ARIs? From my recent experience in Toowoomba I have seen the continuation of the ARI model – how individuals, collectives and the supporters and sponsors can band together to make a space for themselves where none existed before. These ARIs are a hybrid mix of funds generation enterprise including; dance, music and movement classes, funded artists in residence programs, workshops in all manner of art-making and creative pursuits, meeting venues, music gigs, screen-printing and design, child art classes, street art spray painting workshops etc. Some Toowoomba ARIs have been essentially exhibition spaces for University of Southern Queensland creative arts students others are managed by USQ graduates wanting to continue in curatorial roles. Read More about Imagery Gallery HERE.